Here's a little more radial for you! I've noticed in the male prints I've found containing the Suwon crease, they are of highly intelligent men. One even Mensa. The authors give us another clue to the defining factors of the Suwon Crease or rather what it is not. Minor palm creases are divided into two categories. In one category, minor palm creases are defined as palm creases narrower than twice of the epidermal groove width. 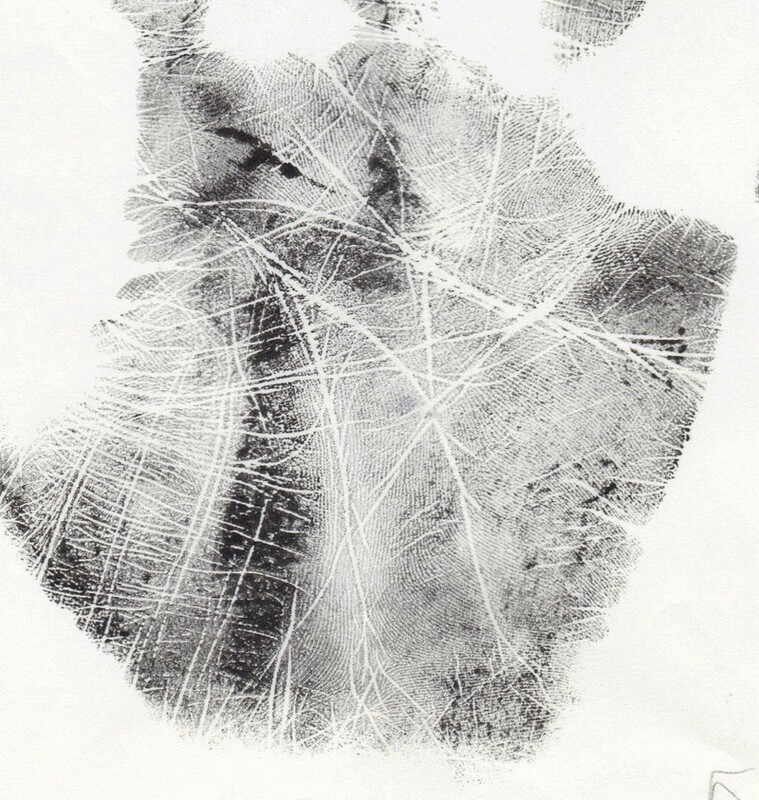 The width of palm creases is in direct proportion to the width of epidermal groove of palmprints, and both widths are in inverse proportion to the amount of stamp ink smeared on the palm. 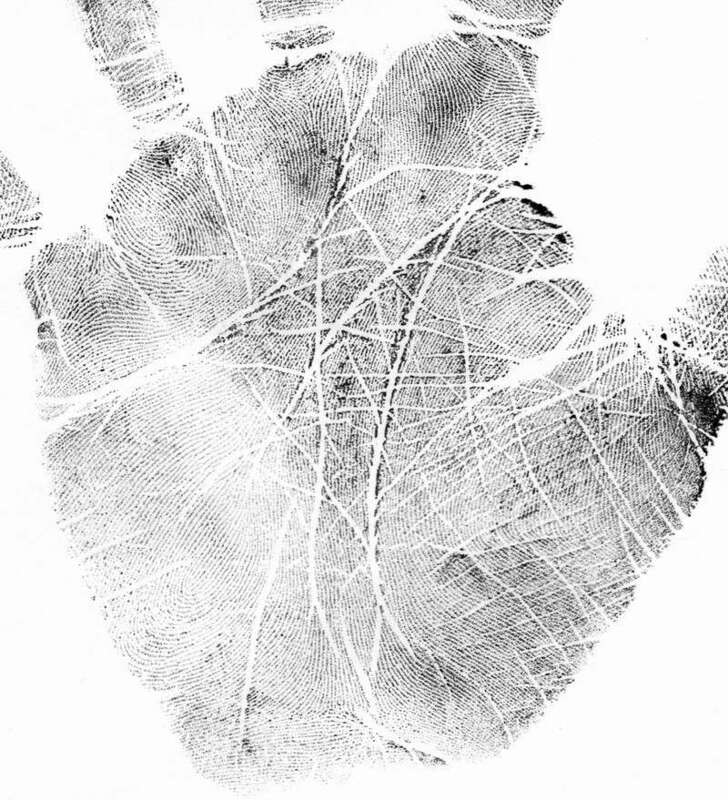 Therefore, the epidermal groove of palmprints provides useful criteria for defining minor palm creases (Dar & Schmidt, 1976). In the other category, minor palm creases are defined as palm creases apart from major palm creases, crossing major palm creases, or connecting to the major palm creases by the sharpened end. The minor palm creases definitely have a different size, number, and direction from major palm creases (Fig. 1). It appears that your female sample definitely has branches that are minor creases touching the heart line or Crease III in that they are connecting by the "sharpened end". Patti wrote: The authors give us another clue to the defining factors of the Suwon Crease or rather what it is not. 2 - And as a combination these lines clearly form a likewise strong structure that is seen in the center of the heart line. So, your point doesn't consider the 'context' of the lines involved! What the authors describe for the 'minor lines' should only be applied to lines which clearly distinguish themselves from the major lines. And I already pointed out to the similarities between my female example and my first male-example: which could be described as a confirm that is concerns a likewise type of line. Patti, at the end one could argue that your point would formally be correct when one considers ONLY some of these yellow/organge lines IN ISOLATION from the other lines involved. But then your point could easily be described as 'out of context'. But one really should not forget to recognize the SIGNIFICANCE of any line in any hand in the perspective of the rest of the hand. For otherwise, one could even use your arguments to say that a large part of the head line AND the life line... are too narrow to consider them as 'major lines', etc. But that would be a likewise 'out of context' conclusion. I think we have reached an impasse due to a mix of subjectivity and having only one sample from the research group. #1) Yes I agree they meet the width criterium. #2) It is a strong structure that matches the center of the heart line. (not a requirement in the article) BUT, I took into consideration their description under Fig. 8 on page 176: "First, minor palm creases are distinct in cases that major palm creases are not distinct, because minor palm creases may supplement the role of major palm creases." It would seem the branches and cascades that extend your sample's heart line to the edge fall into this category with the very fine head line. Note they are still calling them "minor palm creases" even though they are supplementary to the "role of major palm creases". The depth matching the heart line rather than the head line below would support these are supplementary minor creases. They are pretty clear that a minor line is one that tapers or sharpens where it touches the major line. I cannot see a single branch that isn't pointed at the point it touches in your sample. I do not believe at all that I am out of context. In their Sample of the Suwon crease Illustration D (page 171) It is clear that there are no tapering minor lines meeting to form II + III although we can see some minor lines as part of the pattern. In Illustration D, I think if the upper crease that curves downward was of the same quality as the crease below (with it's tapered connection) if wouldn't have qualified. From my understanding, it's not a combination of branches and connecting minor lines, but a clear crease melding or touching the heart line without a tapered point. That is what they show in their sample. Your male sample with the distinct creases would easily qualify. Your samples with the chained branches that you are viewing as conforming to the standards of the Suwon are fairly commonly found. I passed over a fairly large number in my collection of prints. Hence our confusion early on in decerning meeting lines from splitting, branching lines. In my opinion, if the researchers would have included the qualifications of your female sample, they too would have found more females. If their criteria was more relaxed, they would have most likely had more than a .5% result out of 5,196 hands - see table 2. #2) It is a strong structure that matches the center of the heart line. (not a requirement in the article) BUT, I took into consideration their description under Fig. 8 on page 176: "First, minor palm creases are distinct in cases that major palm creases are not distinct, because minor palm creases may supplement the role of major palm creases." Patti, in your response to my 2nd argument you again take a quote out of context. 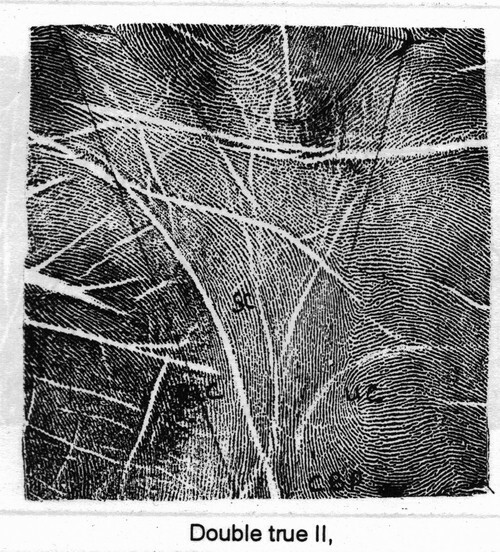 Because fig.8 in the article shows a palm-condition where MANY MINOR CREASES have a width that is wider than 'two ridge lines'. The author's comment obviously relates to that specific phenomenon: when the MAJOR CREASES do not distinguish themselves from the MINOR CREASES. But that palm-condition is not applicable to my female-example at all!! Patti wrote: I think we have reached an impasse due to a mix of subjectivity and having only one sample from the research group. Uhm... does that include your own input in this discussion??? First of all, I already pointed out (before your 'wild-jump' into this discussion) that the researchers have not managed to present a clear definition of the 'Suwon crease'. So, your quote above indicates that we at least have an agreement on that! Actually, I have no problem at all to understand the basic concept of the researcher's discovery (+ the details in their article). First you jumped into this discussion by claiming that the researchers didn't discover anything(!). Then you started sharing your 'I-found-anotherone-collection' of prints (in response I have described why far most of those prints do not have ANY of the basic characteristic of the 'Suwon crease'). And now you continue to share 'out-of-context' attempts to disproof one of my examples... featured with multiple suggestions that my arguments + use of colours in the pictures is a 'mix of subjectivity'. Can you present me at least one single 'objective' argument why your new example is not simply a 'splitting heart line - with one transversal branch'? This is how we all learn Martijn, by sharing and discussing until we come to some conclusion or understanding. I'll address my latest contribution once you respond to the comments on your female sample. Yes, I saw your argument. Please read the article again. Page 174. "First, major and minor palm creases are strictly defined." 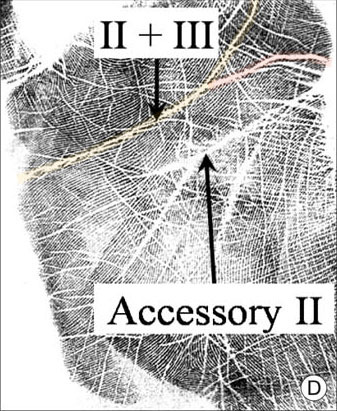 "To define the major palm creases more strictly, the remnant (the minor palm creases) must be defined simultaneously." It describes two categories for minor lines. The text does not imply in any way what so ever that it is an either/or situation between the two categories - both categories were strictly used. Where do you find the Identifying # to the posts, i.e. 17:24 ? It doesn't show on my page...? Patti wrote: Yes, I saw your argument. Yes, the researchers describe two categories for the minor lines - and yes, we can use them 'strictly'. Especially because the second category helps us discriminating a 'Suwon crease' from minor lines! "... In the other category, minor palm creases are defined as palm creases apart from major palm creases, crossing major palm creases, or connecting to the major palm creases by the sharpened end. 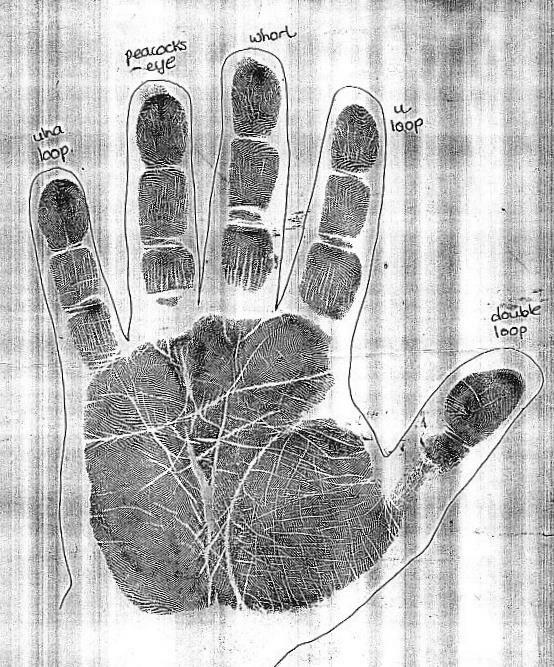 The minor palm creases definitely have a different (1) different size, (2) number, and (3) direction from major palm creases (Fig.1)." In my female-example... both the (1) size + (2) direction of the line(s) involved do not 'strictly' meet the criterium on two aspects of this category 2 of the MINOR CREASE definition. And therefore it can be recognized as typical for a 'Suwon crease'!! (Just like in my first male-example). Additionally, I think the 'number' category only refers to the fact that far most hands displays a much larger number of MINOR CREASES... because usually there are only 3 MAJOR CREASES. My apologies, my 'time-reference' was not useful for you because we both are living in a different time-zone, etc. (I was only refering to the first of my two responses). We will have to agree to disagree at this point on your female sample and one of your male samples. I think again the remarks about Fig. 8 explain the exceptions to when minor creases are more distinct than major creases. This applies to the branches with points in your female sample. Especially so because of her finer head line. My best male example earlier is a martial artist as is another with strong clear creases that I didn't upload. Your male example with the chained creases is most unlikely to have as strong of a hand grip as your second male. I doubt too, if your female has a strong hand grip - from looking at the fine chained lower creases. Oddly, they word it like the powerful grip creates the crease results, when we know these are developed before the hand is gripping much more than an unbilical cord. But, it could be that the minor creases form to close the gaps between the radial starting points to help the person get a grip. The ironly of all this is that the researchers were putting together methods that allowed for objectivity in categorizing creases with strict definitions. I agree I misunderstood the thread in the beginning and added all types of images until I got the concept. I have continuously been willing to accept when I was mistaken and continue onward toward finding the facts. I was attempting to understand the concept from reading the early posts and looking at images. I was thrown off. Once I printed out the article and read it carefully, I added images that fit the descriptions of the researchers. Since these researchers are identifying absolute ( ) ways to categorized creases, I imagine that shortly we will see stricter requirements for Sydney creases and simians. Do you know of a good source for studying a collection of Sydney and simian creases? The main feature that I believe eliminates your female is each of the creases that make contact is narrowing to a point. That one thing eliminates them regardless of matching the other requirements. Otherwise, we could all choose to eliminate various aspects of the strict description to suit ourselves. thanks for the clarification of the Suwon line, very useful, though I feel the heart line completely transversing the palm would be more worthy of a classification. I am confused though at the example used in the research as I see this line as a variant head line which crosses rather than joins the heart line to end near the lines of affection and would have possibly interpreted this as someone who had a profound loss, perhaps the loss of a parent as a child, and who then fears future losses in one's life. But as we have no idea of the sample hands history we can not clarify this. In "Anthropology of Crease Morphogenesis" (R. S. Bali) page 139 Fig. 9.8 from Malvalwala (1971) there is a chart labeled "Types of tranverse flexion creases". Item #5 is similar to the Suwon crease. There are other very similar crease patterns found in the charts on the preceding pages. It is listed as a simian variant. 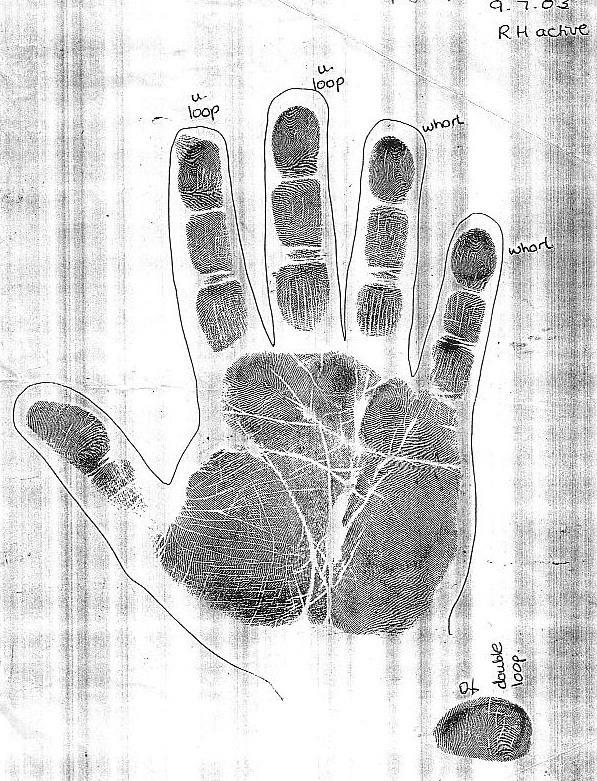 On page 178 (see below) of the same book there is a palm print (very similar to my most recently posted hand image) They named it "Double True II" This implies they are labeling the higher crease as II as well as the lower crease. In "Dermatoglyphics in Medical Disorders" (Schaumann & Alter) Page 109 Fig. 5.5 includes variations of the single transverse crease. Item A is similar to the Suwon crease. This is not meant to go off topic to the Sydney line from the Suwon crease, but in that it appears that the Suwon crease and the Sydney are 'cousins' or formed by the same two creases II + III with different Accessories in II and III. Martijn, I would call your female sample an aberrant Suwon crease. Would you agree to that? I'd even say my last sample is too. I think we have a total of 3 true Suwons. Your male with the clear creases and my male and female samples that I presented previously. Hi Felicity!! I'm happy to see you've joined the discussion. I too was wondering about "meaning". I was thinking more about people with strong hands, their intelligence and emotions. In my area of the world branches from the heart line aiming downward to the headline like these and like Martijn's samples I have often found these to relate to some early disappointment where the person realized they had to rely on themselves or at the least be caution of trusting. Lynn wrote: Thanks for your input Patti & your responses Martijn. Like Patti I am also having some difficulty in defining this line / noticing it on hands. specifically - seeing the difference between split heartline where one branch connects to life/headline, and the true suwon - extra headline that connects to heartline. The basic difference between both examples can be recognized by considering the 'width' of the lines! Again, one really NEEDS to consider the structure of the lines involved - and 'width' is of course a major aspect of the structure..
Do you recognize that in the Korean example the width of the 'Suwon crease' is COMPLETELY DIFFERENT from the heart line? If you recognize that... then it is actually quite easy to notice that in Patti's example both branches of the heart line sort of have the same width, while the head line has a larger 'width'! Can you confirm the difference between these 2 examples? Would you say the same still in response to Lynn's question? As in comparing the width of these creases to the head line rather than to the dermatoglyphics? I would eliminate this particular sample I presented as not following the strict guidelines. Not because of the width of the most distal crease (which appears wider than 2X a ridge width), but because the end is tapered where it meets the heart line or III. Other than that it would qualify. Another Aberrant Suwon! Phew that took some reading! Page 7 already!! this one could run & run! Thanks for joining back into this *hot* discussion!! The left hand is interesting as the head line is fragmented and doesn't start close enough to the radial edge of the palm. (the article refers to a common starting point and this head line doesn't start at that, as they say, "constant" starting point. Felicity Martin wrote: I have been actively reading the Suwon Crease and have found it very interesting but hate the way that it has been 'classified' and named as a form of ownership by the scientific community and disregarding what has been observed for generations of palmists who recognised certain associated outcomes with it and the many variants of these outcomes, depending on behavioral, humanistic etc adaptation to what may be a now named and classified neuropsychological manifestation. Though I accept this need for classification as demonstrated by the Sydney line and the Simian line, but do rankle a bit at the dispersions cast upon those who have, for so long, looked at the hand as more the sum of the whole rather than as a collection of parts. 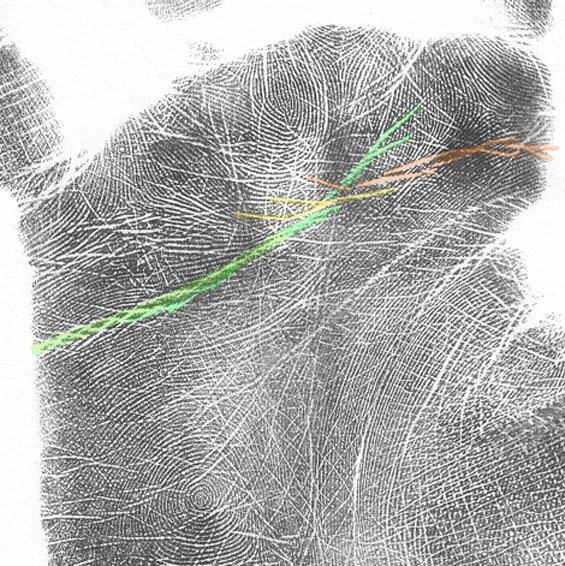 I mean, do I, before others, name the small transverse line that runs from the distal side of the lower sub-thenar mount, the Hallett line, and maybe win accolades because it has a defined place and character and indicates in many cases a tendency to lower back problems? The scientists always do this 'classification & ownership'. eg the Sydney line. I understand what you're saying Felicity. I find some of the scientific studies very limited or tunnel visioned, but it's a start. I am happy that scientists are taking an interest in hands. eg some of the 2D:4D ratio stuff confirms what palmists have been saying for years, so gives us some credibility in science. If you can arrange a study that stands up in science, then I think you can take credit for the "Hallet line" Felicity! (remember folks,we heard it here first!! ) Never seen this line described, not heard of line in that area = back problems (bearing in mind that a high % of the population seem to have lower back problems). Subject for a new topic, please tell us more! In "Dermatoglyphics, Science in Transition" (Plato, Garruto & Schaumann 1991)(page 231) they make reference to this crease. hi Patti, I am not sure they (in your above post) are describing the same thing as the Suwon? Aren't they talking about sydney line + (some form of )heart line, OR straight heartline that extends fully across the hand with (some form of) head line? ?